Fishing in the Gulf of Mandallo is the title of this 2ft 5in (73cm) wide painting by the Italian painter Francesco Lojacono estimated at £30,000-50,000 at Moore Allen & Innocent on July 20. Fishing in the Gulf of Mandallo is the title of this 2ft 5in (73cm) wide painting by the Italian painter Francesco Lojacono (1838-1915), above. 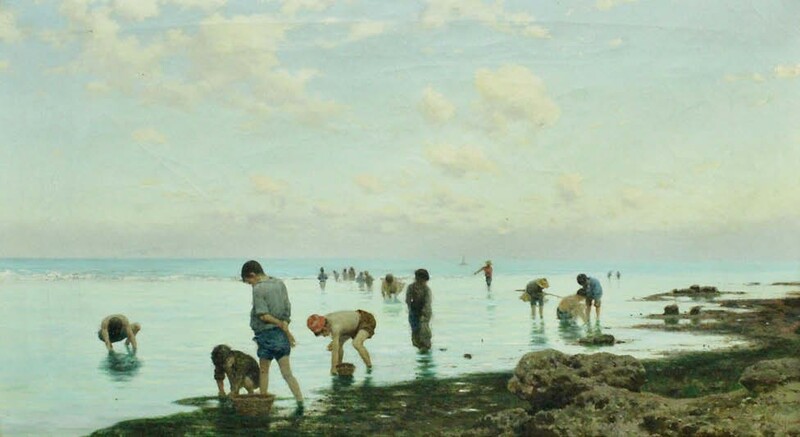 The picture, showing figures collecting shellfish on the Sicilian coast, is guided at £30,000- 50,000 in a July 20 sale at Moore Allen & Innocent in Cirencester. Measuring 16in x 2ft 2in (40 cm x 73cm), it comes from a local deceased estate. Lojacono was born in the Sicilian capital, Palermo, in 1841. He studied under Filippo Palizzi in Naples and made his name painting his lyrical Romantic-style land and seascapes around Palermo and the Sicilian city of Agrigento before returning to Naples as a professor of art, specialising in landscapes.